The name "yellow jacket" refers to several wasp species in the genus Vespula. Some of the most common yellow jackets found in North America are the Eastern yellow jacket (Vespula maculifrons), the Southern yellow jacket (Vespula squamosa) and the Western yellow jacket (Vespula pensylvanica). These insects, commonly found at picnics and outdoor events throughout the United States, share a variety of characteristics. A yellow jacket’s coloring sets it apart from other wasp varieties. A yellow jacket’s characteristic yellow and black stripes zigzag down its entire body from head to abdomen. Unlike bees, yellow jackets do not have a fuzzy, squat appearance; they have smooth, elongated bodies. The average worker yellow jacket is around half an inch long, while a queen can measure three-quarters of an inch long. Two clear wings flank either side of a yellow jacket’s body, and females sport a smooth stinger on the end of their abdomen that can be used to sting multiple times. Yellow jackets have a reputation for being aggressive that isn’t entirely unfounded, though it is misunderstood. Typically yellow jackets are peaceful insects, but they will not hesitate to attack if threatened. This is why it’s important to avoid swatting at or otherwise disturbing yellow jackets. These wasps use their stingers solely as defensive weapons, while their jaws are used to capture and kill prey. Most yellow jacket species are ground-nesting, preferring to build nests in rodent burrows and other cavities near the ground. The queen initiates construction of a nest made out of a paper-like material made from wood fibers, stem fibers and other fibrous material, such as paper bags and newspapers, mixed with her own saliva. 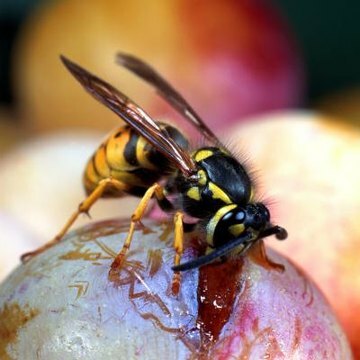 Adult yellow jackets use their tongues to feed on nectar, fruit juices and other foods rich in sugar, such as soda and ice cream, while insects and other small arthropods are fed to yellow jacket larvae. Worker wasps capture prey for immobile larvae, slice it into manageable pieces with their jaws, chew it into a paste and then feed it to larvae through a process called trophallaxis. The worker tickles the larva, causing it to secrete a liquid through its salivary glands. The worker then feeds on the liquid, and while drinking transfers the paste back to the larva through the salivary glands. Yellow jacket reproduction generally occurs in the late summer and fall. Male yellow jackets die after copulation, and fertilized female queens must find a safe place to hibernate during the winter. The queens emerge around April or May and lay 20 to 45 eggs, which will produce the first generation of sterile female workers. She continues to lay fertilized female eggs and unfertilized male eggs until about halfway through summer. At this point workers expand the nest and breed to produce colonies up to 250,000 strong until the end of the season. When fall arrives, all but impregnated queens succumb to cold temperatures and copulation. The cycle repeats each year.